MBC The Moon that Embraces the Sun directed by Kim Do Hoon made public the shooting scene of adult actors. 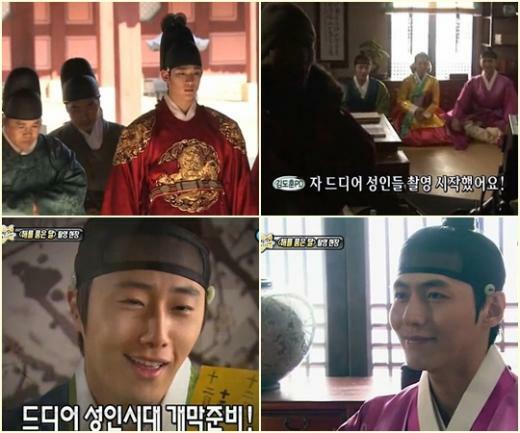 On the MBC variety show Section TV Entertainment broadcast on January 15th, 2012, the sageuk The Moon that Embraces the Sun exceeded 20% ratings mark in just 3 episodes became the discussion topics, and the shooting scene of adult actors been revealed for the first time. On the filming set on the day, the fictional Joseon Dynasty king Lee Hwong (Kim Soo Hyun), Prince Yang Myung (Jung Il Woo), Princess Min Hwa (Nam Bo Ra) and Heo Yeom (Song Jae Hee) were concentrating on filming. In particular, the performance of adult actors are outstanding just like the young actors, which is worth the wait. They will debut officially in the episode 7 broadcast on January 25th, 2012. and as adult actors play children’s performance is also very prominent actor, worth the wait, they will broadcast the 25 officially debut the 7th round. Audiences exposed their anticipation for the debut of adult actors with comments such as “It’s complete mobilization of flower boy actors,” “The acting of young actors is 100% artistic,” “The acting of child actors is beyond expectations, but after the adults debut, it will be more interesting,” and so on. On the other hand, The Moon that Embraces the Sun aired on January 12th, 2012 rated 23.4%, breaking its own highest ratings record continuously, and proven its popularity.